Numbers! 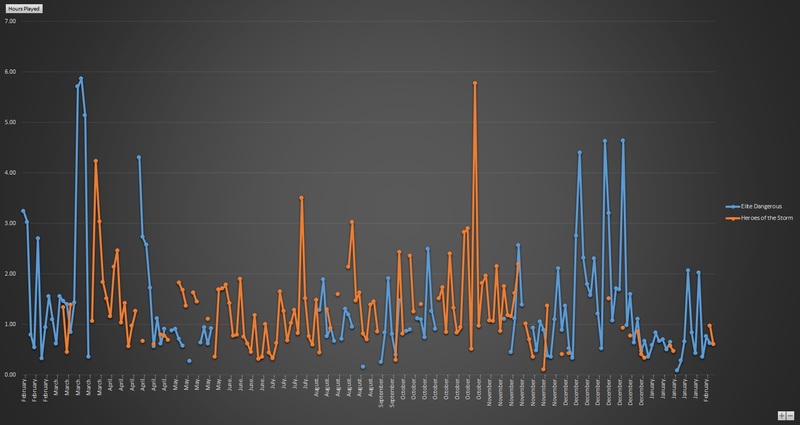 Graphs! 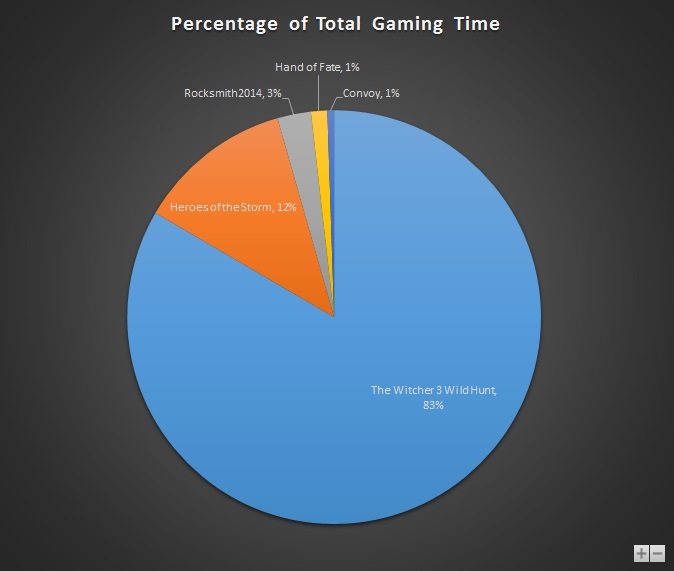 A documented analysis of how to waste time on the PC! 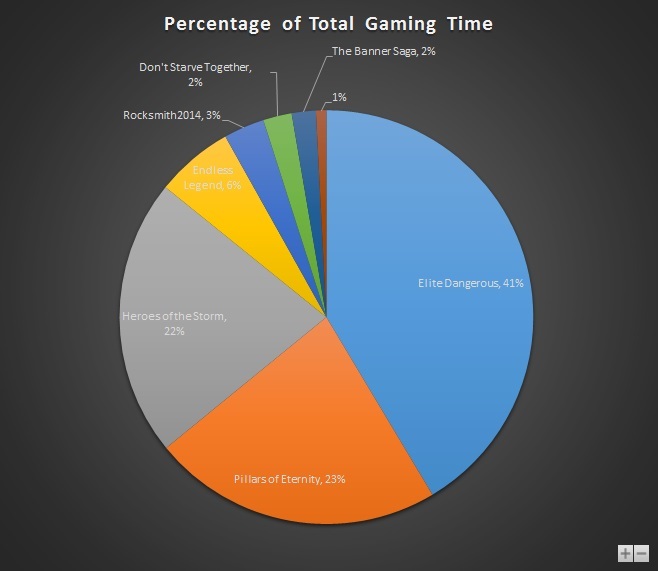 I’ve broken the stats down into various sections and the original data is here. 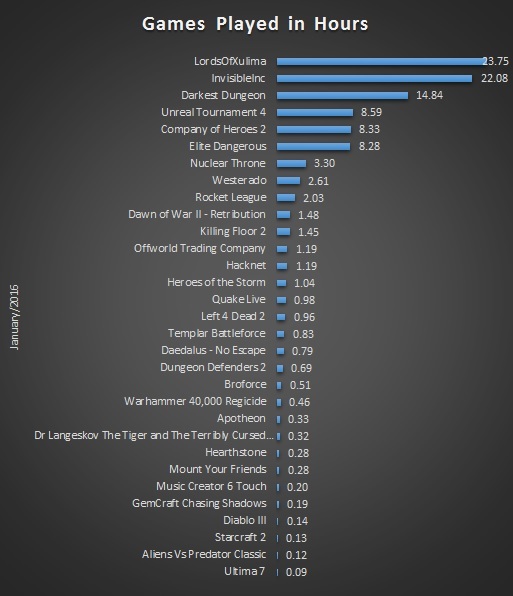 There’s a lot of games so in most cases I’ve summarised the top entries on the chart; click on the chart for the full version where it’s available. 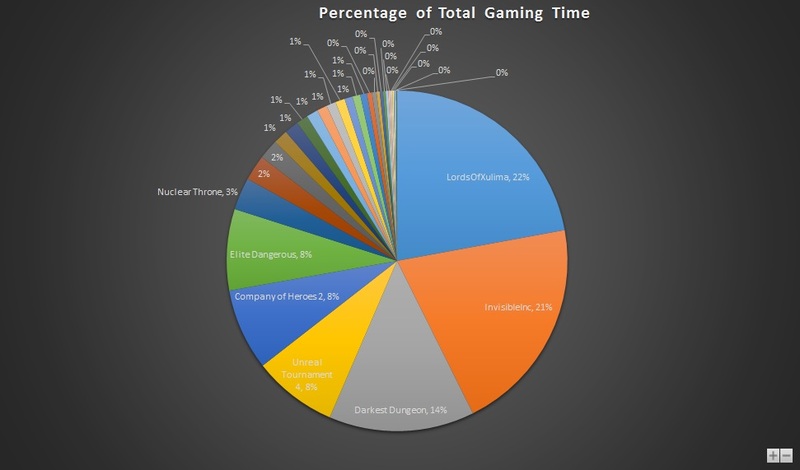 Some background: I’ve got a (fairly geeky) family so while this measures how long the game processes have been active I may be leaving the game running while I take knives away from the dog or stop the children eating moss. 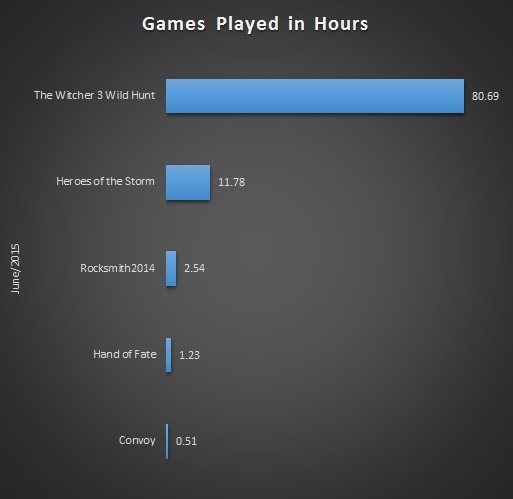 Diablo 3 is pretty impressive for a game that’s almost four years old. Lots of extra stuff was added in the expansion pack and the seasonal characters are brilliant for getting you back into it. 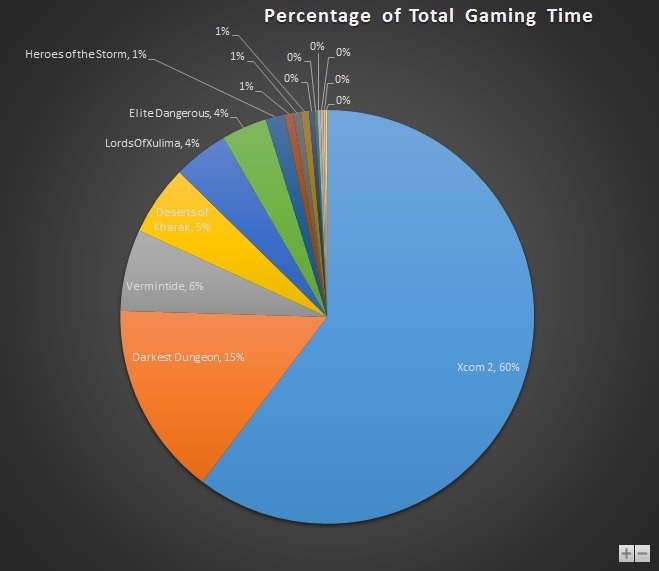 This is an average of the time spent on each gaming session. 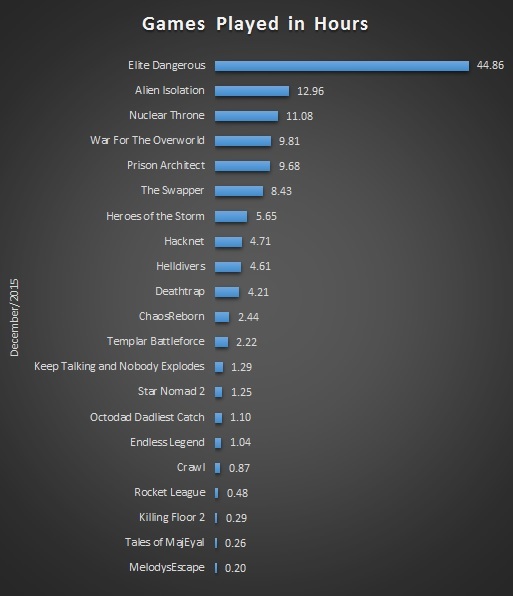 Elite drops off here as while there were more sessions than any other game, many of them were quick hops for a trade or a quick skirmish in a HazRes. Consortium was quite a short game but it really grabbed me while I played it. Starcraft 2 benefited from coming out just after a work contract had finished (so I had some more time) and after I’d got another contract (so I treated myself for a week of relaxing. 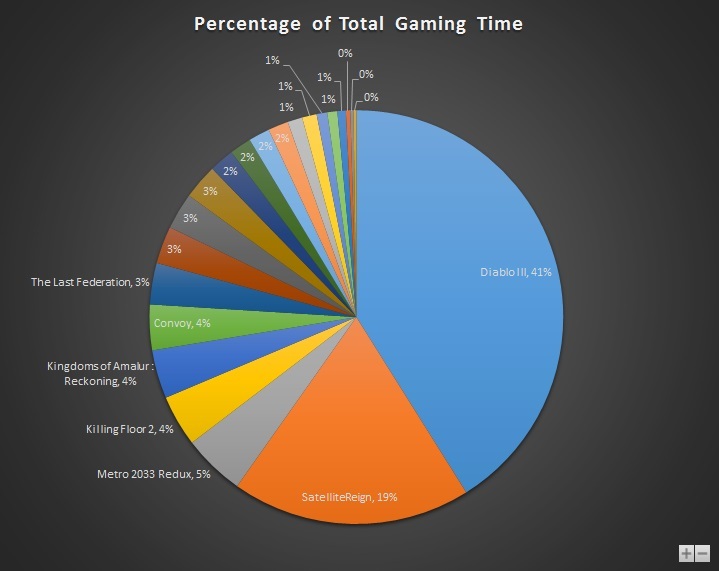 Well, as relaxing at Starcraft ever is). 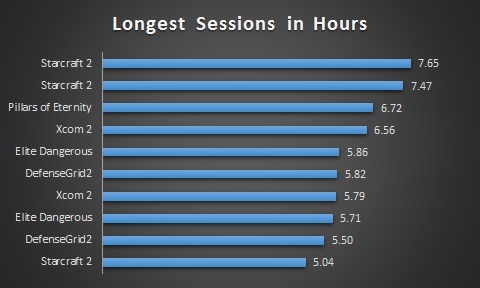 Lots of long sessions! 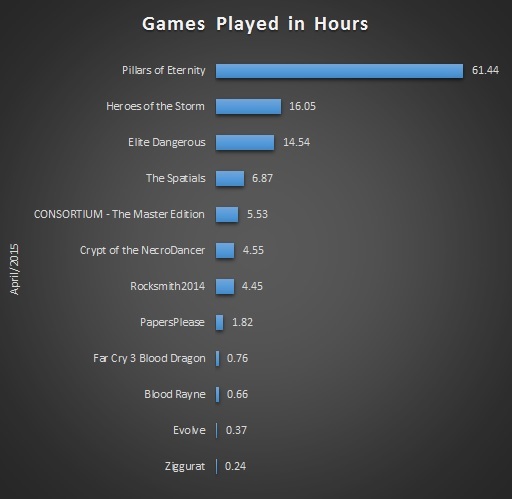 Pillars’ atmosphere was fantastic so I disappeared into that for a weekend after it released. 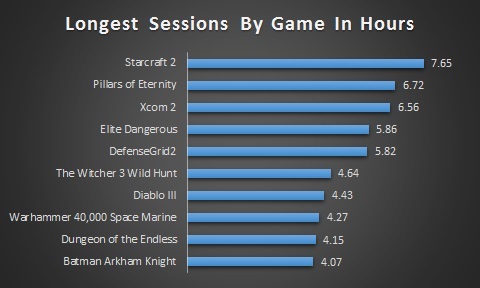 The longest gaming sessions for each game. 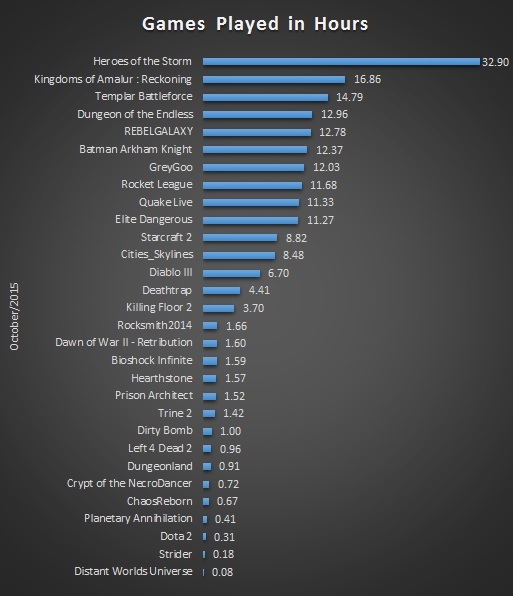 No massive surprises for me there except maybe for Space Marine. 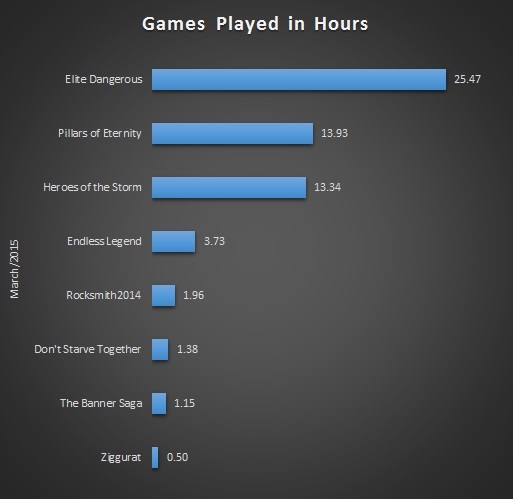 I slammed my head into Dungeon of the Endless on several occasions just trying to get through “easy”…. 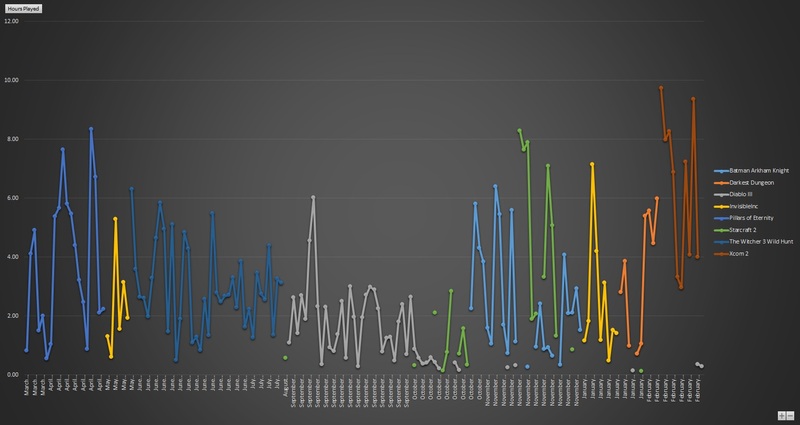 This shows the play-time throughout the year of the two games I kept coming back to. 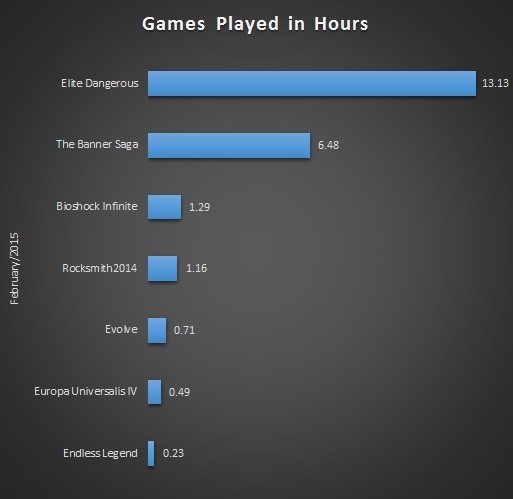 You can see when I really first got into Elite, where the expansion was released etc. 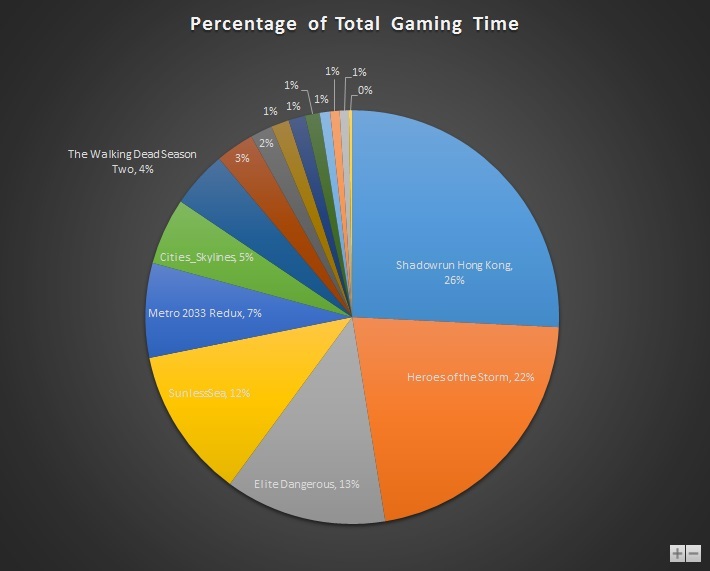 Not sure what happened with Heroes of the Storm in October. 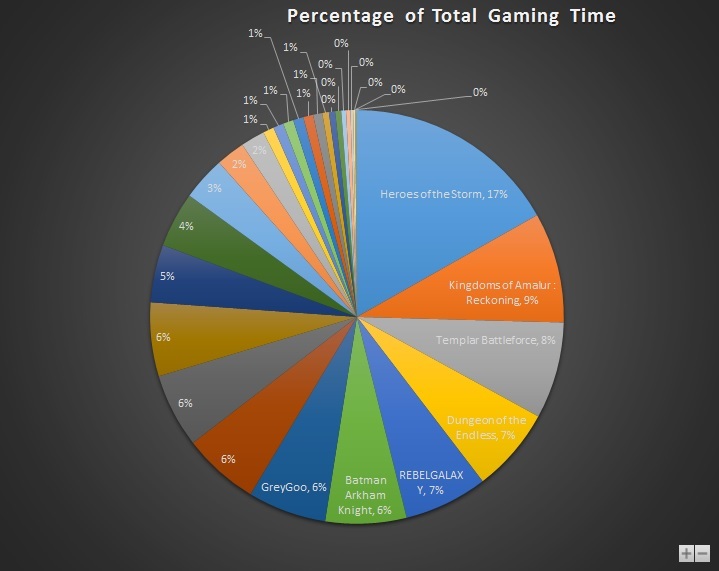 Maybe the run up to Blizzcon? 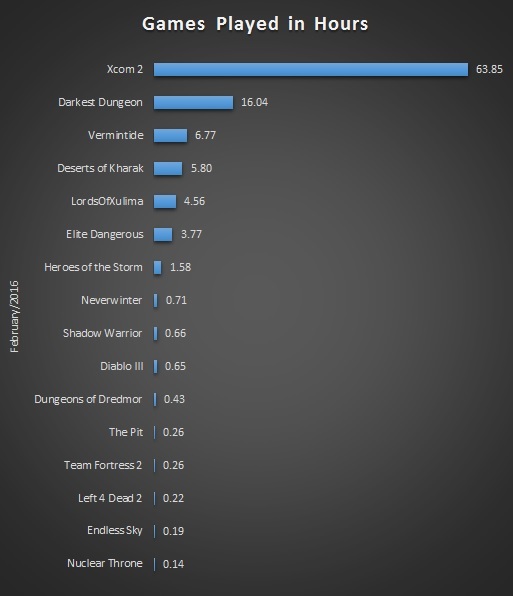 The other most played games were a bit more seasonal 😀 XCOM 2 was over one really intense week and you can see the Season 4 duration for Diablo 3. 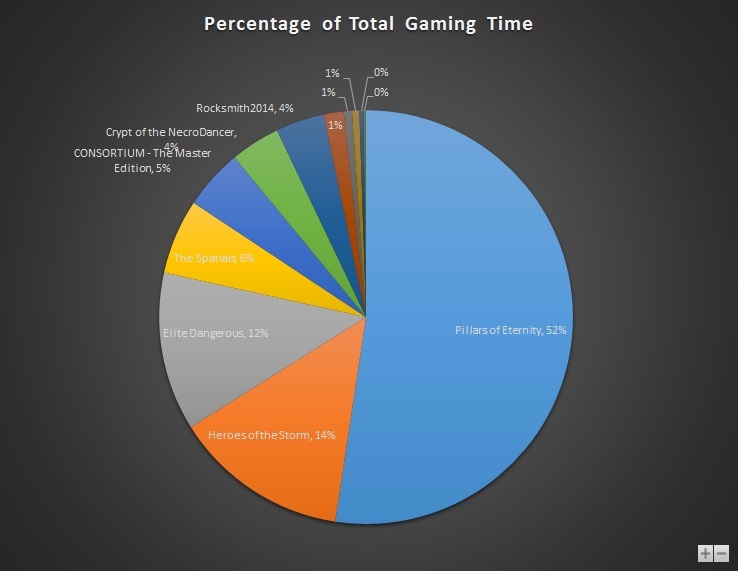 Only a week or so’s worth of stats for this month. The Banner Saga had a great atmosphere but I’m not sure I’ll play the next ones, I found it quite relentless in its negativity. I felt like I was escorting a bunch of red-shirts across Scandinavia. Bioshock Infinite yet again! Playing it through with my eldest which is pretty awesome. Don’t Starve Together I play with my wife. It’s brilliant; we’ve had lots of bonding experiences starving or being eaten. HOTS I mainly play with the kids (my youngest is great at LiLi). Good fun with the family and unlike going outdoors the chances of being eaten by a bear are fairly low. The Spatials was a strange one. Just kind of pootled about with it really. There was never a massive challenge but it was nice to play with. 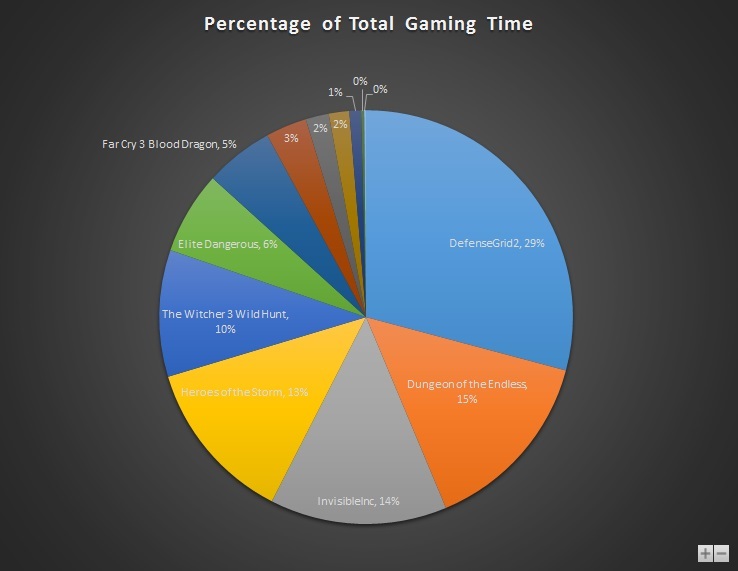 I was a gaming dilettante this month! A bit of this, a bit of that. Clearly still not able to finish Dungeon of the Endless 😐 No major releases to eat my brain so it’s nice to get a bit of variety. 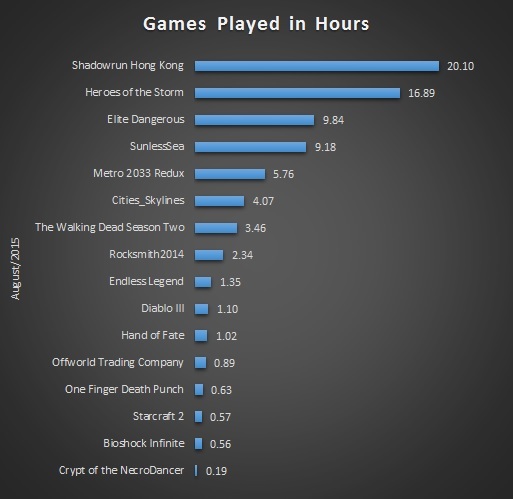 The Witcher 3 was released at the end of the month though…. … and the wheels quickly come off the wagon. 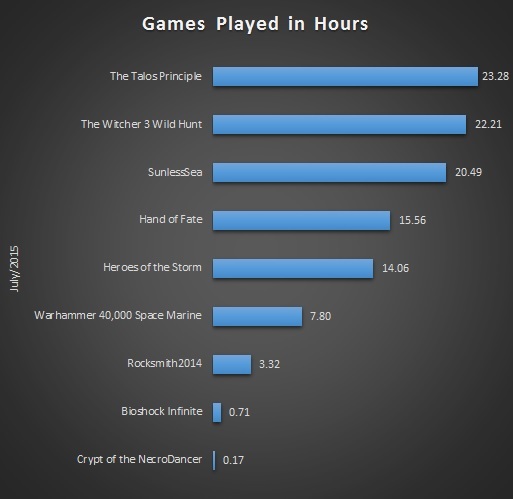 Finishing off The Witcher 3 here. 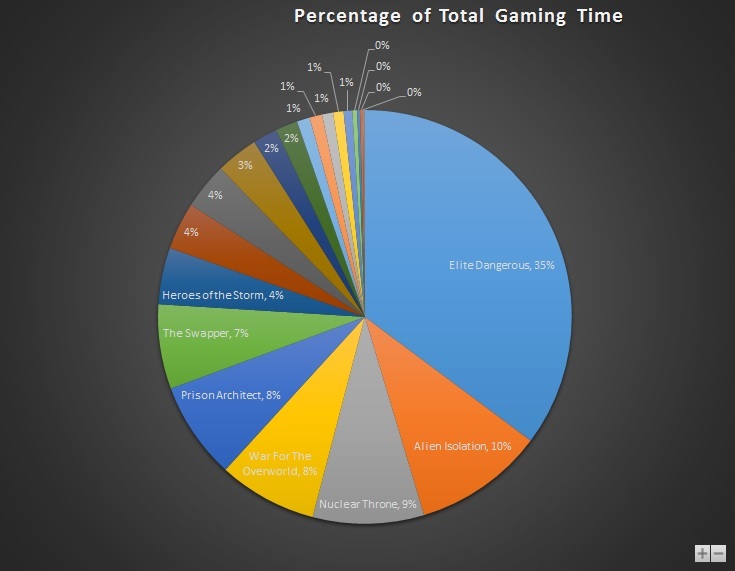 Sunless Sea was good fun, though I’ve never finished it; I think I’ve seen most of the story and in order to finish I’ll need to grind away for the last part of the game. The Talos Principle was brilliant. I got back into Diablo 3 with the release of Season 4. 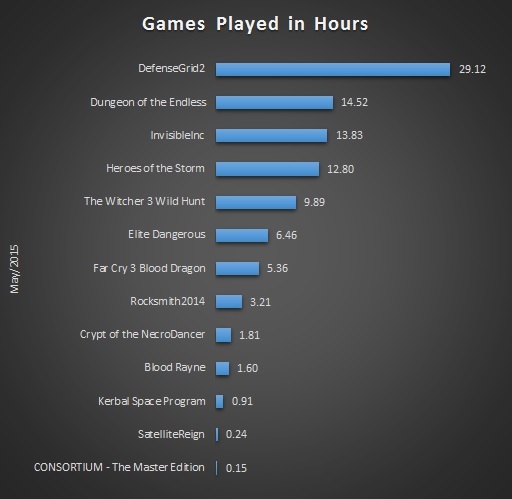 I’d not played much of it since the release of Reaper of Souls so I’d not had a chance to try all the gameplay changes before then. The changes, they were good. Another kickstarter I backed came out here with Satellite Reign. I loved Syndicate and this was a fun successor. I think I found out my contract was going to come to an end about now and I think I went on a spate of finishing up old games to compensate. Between contracts here so lots more gaming time and we had a LAN party so a solid weekend of gaming. 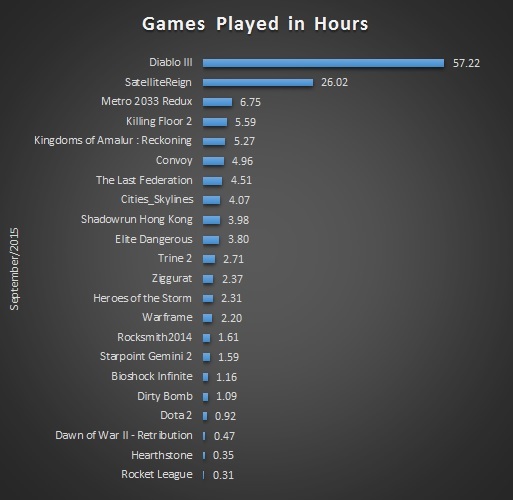 Also shows why so many multiplayer games crept into the ranks for a change. Templar Battleforce is a nice little top-down tactics game. Starcraft 2 released and I celebrate getting a new contract sorted out. 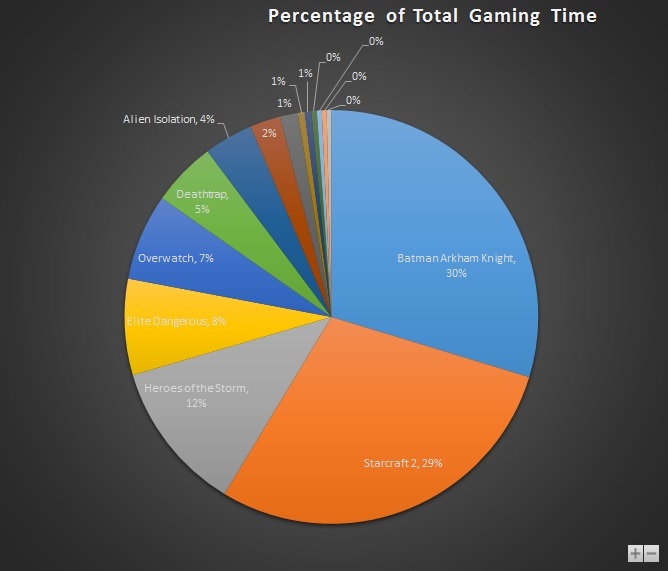 I also managed to get onto the Overwatch stress-test weekend. I was really into the idea of an old-school RPG so I started playing Lords of Xulima. 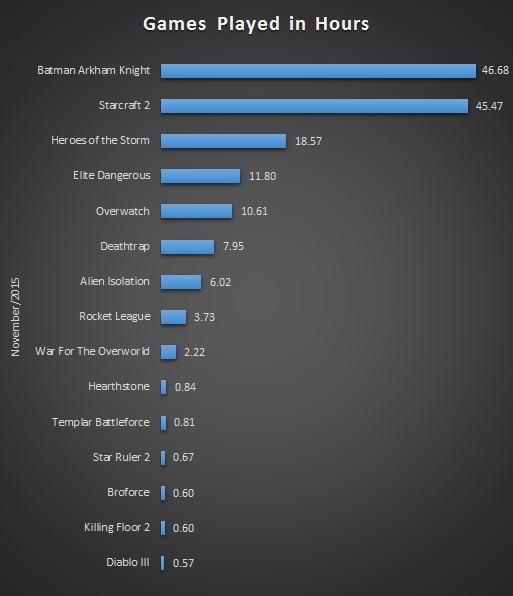 Another LAN weekend and we played the hell out of Unreal Tournament 4…. Well, it dominated my thoughts for a good week when it came out. I still miss it after finishing it (took 12 attempts to finish Ironman/Commander). In two minds now whether to start again or wait for all the content to come out in summer! 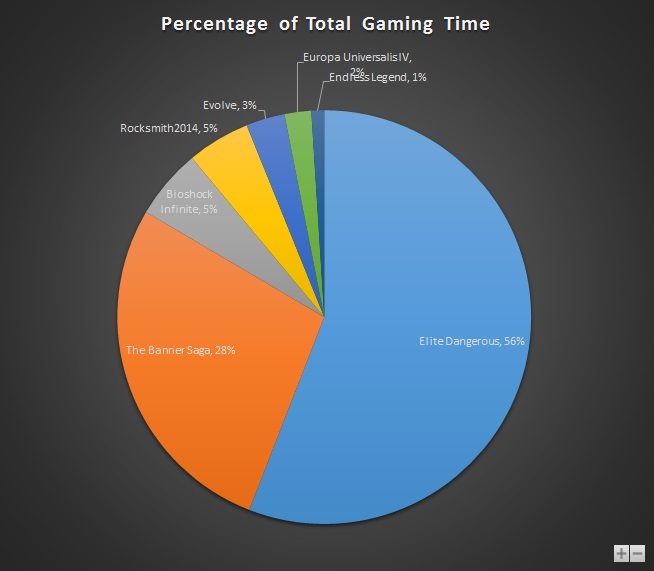 In the last year I played 99 different games for about 1400 hours of gaming total. 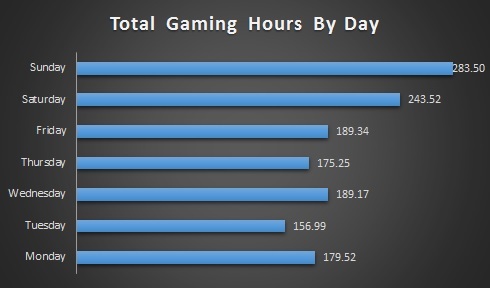 That’s 3.8 hours per day on average. 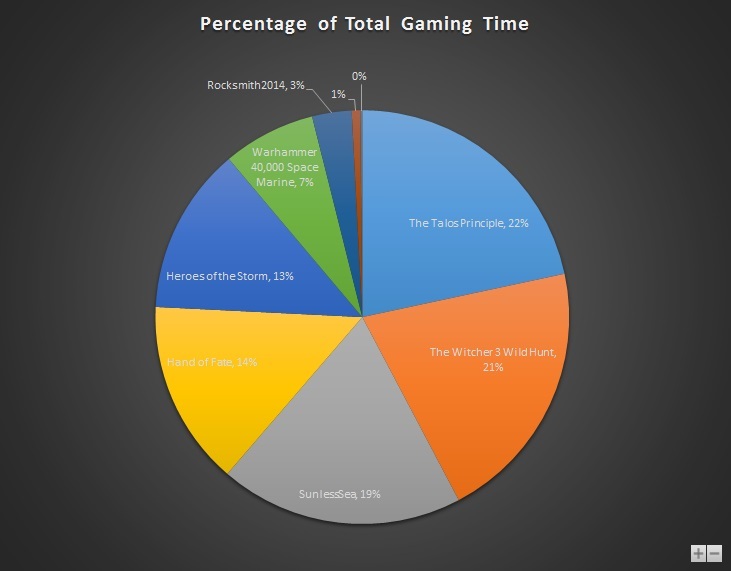 Assuming I’m awake for about 17 hours that makes me about 22% a gamer. Bumping that stat could be a little tricky but maybe when the kids have grown up and I’ve retired….